An alcohol addiction hotline can be a lifeline for people in crisis. These numbers, which are usually toll-free, provide the initial intervention to get addicts on the road to recovery. Compassion and helpful representatives manning these helplines provide useful information about available resources and treatment options for excessive drinking. Which is the best hotline to call when craving alcohol? Is an alcohol helpline free? Let’s find out more about getting help over the phone for alcoholism. What are the national alcohol helpline numbers? What are the local alcohol helpline numbers? How does an alcohol addiction helpline work? What are the reasons for calling a rehab helpline number? What are the common concerns about calling alcohol abuse hotline numbers? What questions will the hotline representative ask? How to call an alcohol hotline? 911: This is the 24-hour emergency phone number for any life-threatening or crisis situation, including alcoholism-related problems. 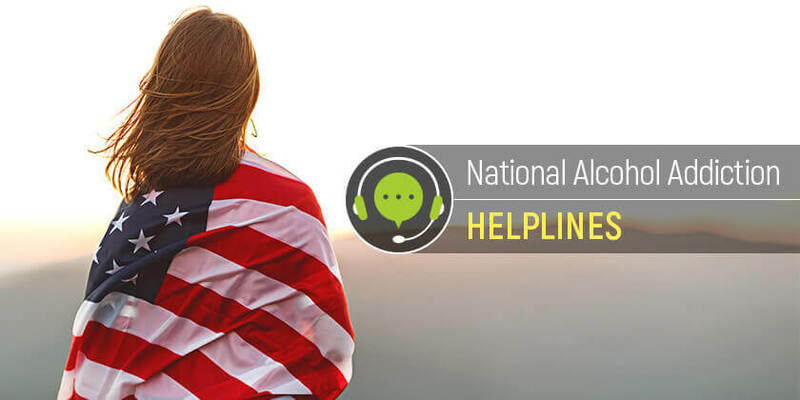 National Council on Alcoholism and Drug Dependence (NCADD): 1-800-NCA-CALL (622-2255): This nationwide alcohol crisis hotline offers information, education, and hope to people with a drinking problem. National Institute on Drug Abuse (NIDA): Call 1-800-662-HELP (4357): This 24-hour helpline is dedicated to preventing substance abuse. In addition to the toll-free number SAMHSA alcohol abuse hotline, online help is available to locate treatments and trials. National Poison Control Center: 1-800-222-1222: This is a free and confidential alcohol poisoning hotline that is available 24 x 7. Experts are available with advice on all kinds of poisoning, including drugs and ethanol. National Suicide Prevention Lifeline: 1-800-273-TALK (8255): This number is available around the clock to people in distress. Representatives provide free help and resources through locally-operated crisis centers. Alcoholics Anonymous: 1-212-870-3400: This national alcohol helpline has a team of volunteers who have experienced drinking problems and are willing to help those struggling with alcoholism. Covenant House: 1-800-999-9999: This is a general crisis and alcohol helpline for family and adolescents dealing with drinking and other problems. The counselors at this number specialize in homeless and runaway teens. What Is An Alcohol Abuse Hotline? An alcohol abuse helpline is a phone service that provides assistance to individuals with a drinking problem. This number is typically operational 24 hours a day, seven days a week. It is answered by non-judgmental, compassionate, knowledgeable counselors who are trained to help those with alcoholism-related issues. In addition to general information about recognizing the signs and symptoms of abuse and addiction, an alcohol support hotline also provides immediate access to treatment advice and local resources. This allows people to obtain help and support without spending the time and money involved in visiting an addiction treatment center. The services offered by an alcohol hotline number are confidential. Most numbers are toll-free, and the caller usually does not incur any cost. If an individual doesn’t have the time to visit an addiction treatment facility in person, if they are embarrassed to discuss substance abuse with friends and family, if they worry about being judged at the workplace, or if they just want someone to talk to about their addiction, an alcohol hotline in the USA offers free, confidential advice, clarity of thought, non-judgmental support, and information on addiction resources. Cost: Is an alcohol hotline free? In most cases, the addiction assistance helpline is toll-free, and the caller does not spend any money to speak to a trained representative. Advice is offered free of cost and without obligation. Forced Actions: Some people worry that after they call an alcoholism hotline number, they may be forced to take certain actions, such as involuntary entry into an addiction rehab program. However, the information offered by an addiction helpline is unconditional, and it is entirely up to the caller whether to act on the advice or not. Legal Trouble: There are understandable concerns about going to jail after telling a representative about substance abuse. However, an alcohol anonymous hotline does not force the caller to identify themselves and will not lead to legal problems. In fact, not getting help for abuse and addiction can land a person in the criminal justice system. Confidentiality: A 24-hour alcohol abuse hotline is completely confidential. Callers can choose to remain anonymous. Counselors do not ask for any personal or identifying information. What Will the Phone Representative Ask? Are you in crisis or is your life in danger? What are your age and location? What substances do you abuse besides ethanol? What is the duration and severity of your addiction? How frequently do you drink alcoholic beverages? Do you have any co-existing mental health problems? Do you have any other medical conditions? Are your friends and family aware of your addiction? Do you feel motivated to start treatment for substance abuse? Have you previously called an alcohol withdrawal hotline or undergone inpatient or outpatient rehabilitation? Step 1: If it’s an emergency, call 911 immediately. In non-emergency situations, identify the best alcohol awareness hotline for your purpose. One helpline may specialize in a specific substance; another may cater to the needs of teenagers. Step 2: Make a note of answers to the most commonly asked questions by counselors at an alcohol treatment hotline. Also, write down a list of questions you want to ask the experts at the helpline who will advise you. Keep insurance information on hand. Step 3: Call the addiction helpline number and choose the appropriate options from the automated response system, including your location, language, etc. This ensures the call is routed to the appropriate representative at the 24-hour alcohol hotline. Options: What treatments are available? Location: Where is the nearest rehab facility? Duration: How long will addiction treatment take? Cost: What is the approximate cost of substance abuse treatment? Insurance: Will insurance pay for addiction therapy? Additional Resources: How to find a reputable treatment facility in the local area? Specialist Services: Is there withdrawal management or alcohol detox hotline to call? Faith-Based Addiction Help: Can you direct to a Christian alcohol addiction helpline for information on faith-based rehab? Free Addiction Treatment: Are there any free rehab programs? Access to free, confidential, expert advice on substance abuse is just a phone call away. Knowledgeable, empathetic, and non-judgmental counselors are on the line at an alcohol anonymous helpline for support. An alcohol treatment helpline is usually the first critical step in the long road to recovery from addiction. The counseling offered by an alcohol abuse helpline USA can help Americans struggling with drinking problems get their lives back on track.